A Hornsey lad, David Evans was a 10-year-old schoolboy in 1939, and when the war finished he was 16 years old. He recalls his experience of the evacuation, returning to the bombing of London, plus VE Day, and the 50th anniversary celebrations of VE Day. This is a 5 minute clip from the DVD. David has made this film for his grandchildren to tell them what it was like in the Second World War, and has managed to record his experiences with some unique footage. Details of how to order can be found on the orders page. 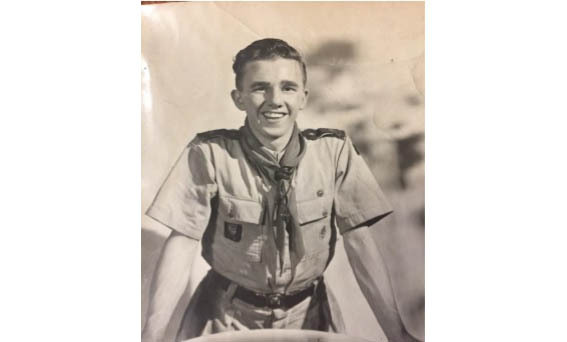 David Evans as Scout Leader, c.1950. Further reflections by local film maker David ‘Tec’ Evans of Hornsey’s ever changing scene in a double DVD. This is a 13 minute clip from the DVD. Price: £12.00 + £1.50 p&pDetails of how to order can be found on the orders page.